I was a sophomore in high school, about 15 years old, when a rather hostile group of cheerleaders and football players cornered me, yelling, as I sat on a bench in the quad between classes. “Don’t you have school pride?” a cheerleader shouted. “You should feel proud! We’re honoring your people!” one football player hollered. I was the only Native American (as far as I knew) at Woodbridge High School in Irvine, California. Irvine is a planned city in Southern California and one of the safest cities in the United States, but I didn’t feel safe that day. 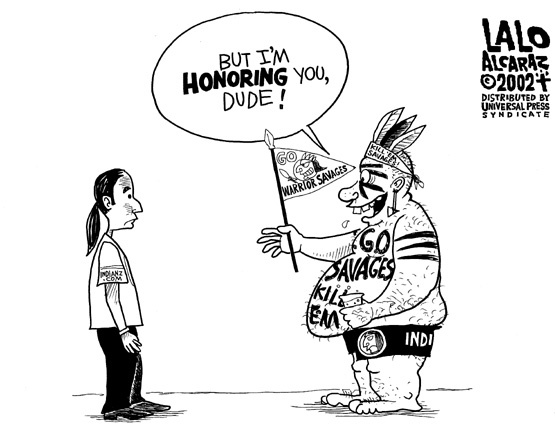 I had met one-on-one with the principal, my guidance counsellor, a few teachers and several students to share my negative feelings toward our school’s mascot – an anonymous Native American “warrior” with long, flowing, jet-black hair, a large nose and huge muscles. I guess I thought if I made it known that I felt appropriating Native American imagery was offensive, they’d stop. I was outnumbered, though, and my personal feelings didn’t matter. But that’s the thing: As Native people, especially as urban Natives (what we Indigenous people living in urban centers call ourselves), we are almost always outnumbered. So, we go unnoticed and unheard. Our opinions never really matter. Students wore goofy, cartoonish costumes of our mascot (and his equally tasteless “warrior princess” girlfriend) at pep rallies and games. The pair would dance and do occasional acrobatic moves, as they made their grand entrance to the deafening sounds of the school’s marching band, playing the quintessential Hollywood fight song that, for me at least, conjures up images of a scene from an old Western movie: “savage” Indians on horseback approaching a village of settlers…Uh-oh, there must be trouble. Aboriginal DJ Group “A Tribe Called Red” Drops Their Debut Album…and it’s FREE! Ottawa-based Aboriginal DJ group, A Tribe Called Red, released their debut alum for FREE today! The best way I can describe their sound is a modern, electronic remix of traditional Native pow wow drumming and singing. Whatever you want to call it, you can’t deny how incredibly awesome and talented these guys are. Some of my favorite tracks include: “Native Puppy Love,” “Woodcarver,” “Red Skin Girl,” and “Look At This.” All the tracks are good, though. But, don’t take my word for it, go check it out for yourself! Download the album here…and be sure to spread the word! Here’s a piece I did about A Tribe Called Red’s music and their “Electric Pow Wow” while visiting Toronto last year for ImagineNative. Enjoy! I just stumbled upon another great piece of journalistic work by Wab Kinew for CBC News. I’m a huge fan of Kinew’s work and I hope to collaborate with him one day (soon). I’m sure I could learn a great deal from him. Take a look at this video. Though our experiences in the US aren’t identical to what Canadian Aboriginals faced, there still are many similarities. Can you or your family relate to anything you saw here? Please feel free to share your story.